Mortgage magnets are perfect for mortgage businesses that are trying to improve their business credibility through non-intrusive marketing. Full-color refrigerator magnets make a great business advertising tool for everyone because people will retain them on their refrigerator doors or working cabinets. 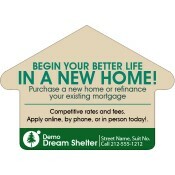 Mortgage businesses usually flourish through referrals and these promotional magnets easily aid them to make their business a talking point. Made in USA magnets. Avail the lowest wholesale prices ever offered by any online store! Today, mortgage businesses understand that for operating a successful business they need to keep in touch with their clients. 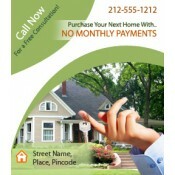 This is why many mortgage businesses are ordering custom mortgage refrigerator and car magnets more than before. They understand that it will easily help them to connect with their techno–savvy and non-techno savvy clients. Mortgage marketing is becoming challenging due to an increasing demand for mortgage loans. Today, businesses are relying on various online mediums to increase their business visibility and address their clients, but that is not enough. It is not always possible for people to check their mails or take it to Google for finding the contact information of their mortgage loan services. 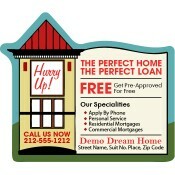 Mortgage services can easily ease this wait time by sending them or handing them customized mortgage magnets. Finding new customers is always important for the survival of mortgage businesses. A solid marketing strategy will aid them to attract new customers. 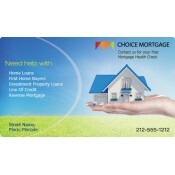 They can easily couple these finance magnets with their existing promotional strategies for better benefits. Mortgage businesses largely seek benefits from local clients. 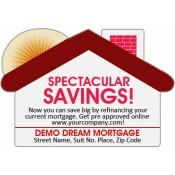 They can easily target their local clients during tradeshows or other mass events by giving logo printed mortgage magnets. In addition, mortgage professionals and businesses can work in coordination with local real estate agencies. There are few real estate agencies which also provide mortgage loans for their clients. 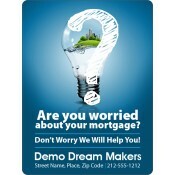 They can easily combine these mortgage refrigerator magnets with any of our best-selling real estate magnets. We offer free art setup, free online design proof and free shipping with all our customized magnets. Colorful advertising is still perceived as a million buck affair, however, we offer free full-color printing. This means advertisers have liberty to choose as many colors as they wish without worrying about the set up charges. To know more about customization and distribution of these personalized magnets, feel free to contact us at 855-762-4638 or write to us at info@cmagnets.com.